Have you ever wanted to live in a house where space does not matter? 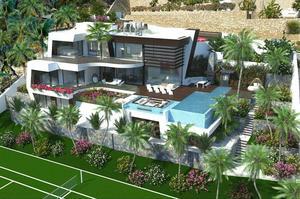 Spanish Property Sales fulfills your purpose, offering you an amazing catalog of villas for sale in Benissa. In this range of properties for sale, you will not have to worry about the lack of space, the little intimacy or the well-being of your family. We offer you new build or resale villas in Benissa so you can start your new adventure on the Costa Blanca as you have always dreamed. Our estate agents in Moraira are experts in helping to fulfill the wishes of clients looking for a home on the Spanish coast. We are used to dealing with foreign clients, so if you come from outside Spain, you will not have to worry about adapting to a new destination either. Benissa, our villas and our professionals will provide everything you need to make your integration in Spain as comfortable as possible. In Spanish Property Sales we streamline the entire purchase process, so you only have to think about enjoying your new villa in Benissa. If you are looking for luxury villas for sale in Benissa, in Spanish Property Sales we can also offer you the property you are looking for. We can offer you an exclusive catalog of luxury villas in Benissa so that you can achieve maximum pleasure and well-being on the Costa Blanca. One of our magnificent luxury villas for sale in Benissa, offers 4 bedrooms, 3 bathrooms, a modern pool and a Mediterranean style garden. All of them in a house of 370 m2 built on a plot of 1090m2. This luxurious villa has everything you need to live without worries. If you love relaxation and silence, in this villa you can enjoy a relaxation area next to the pool. Close your eyes and let your five senses come out. Relaxation not only you can enjoy in this fantastic area. The villa has a large terrace so you can contemplate a beautiful landscape to its surroundings. Wake up every morning and have breakfast in an idyllic atmosphere. Which style of villas for sale in Benissa do you prefer? As you can see, our estate agents in Costa Blanca offer you several styles of villas for sale in Benissa. We love meeting the needs of any client interested in one of our properties. If you are looking for a second hand, new build or luxury villa in Benissa, Spanish Property Sales can offer it to you. We invite you to get in touch with us to know more details of our villas in Benissa. You can reach us by calling (0034) 966 492 515 or sending an email to mail@spanish-property-sales.net . If you decide to call, one of our professionals will attend you superbly. If you decide to write us an email, we will respond in the shortest possible time.